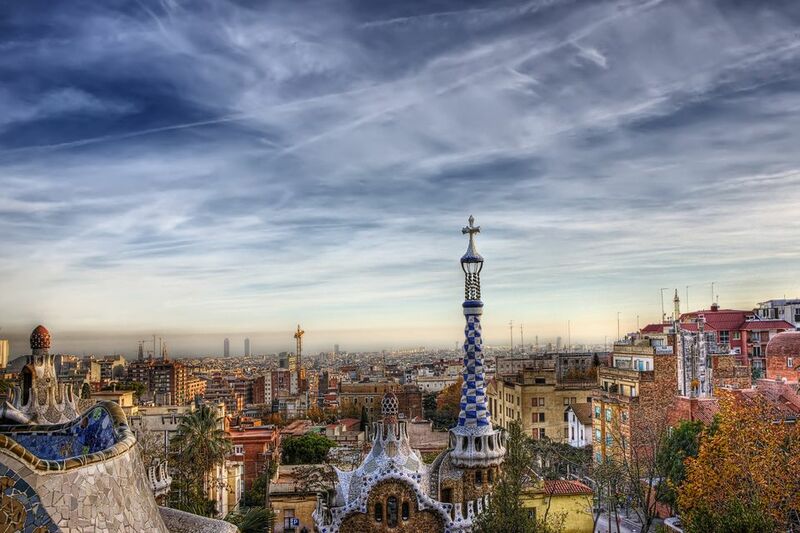 Barcelona is graced with relatively mild winters for Europe and hot summers. You won't be sunbathing in Barcelona in November, but it is very pleasant for sightseeing with temperate daytime temperatures. The temps do not drop tremendously at night until the end of the month. The tourist season is over so hotels and travel deals should be easy to find. November is considered a transitional seasonal month, so there can be days as warm as the high 60s F, with average monthly temperatures in the mid-60s. The weather tends to stay quite pleasant throughout the month, rarely hitting 68 F and usually not falling below 50 F until the end of the month. Large fluctuations in temperature are rare in Barcelona due to the city's proximity to the warm waters of the Mediterranean Sea. Rainfall is always possible, so carry an umbrella. Early in the month, you will still experience some balmy evenings for terrace dining and evening strolls around this eminently walkable city. As the month rolls on, the weather in Barcelona does not change much. By the time you reach late November, you will need to break out the sweaters and light jackets. You will still find some warm, sunny days, but temperatures begin to drop at night into the 40s F.
Barcelona can be tricky to pack for in November as it is a going through a seasonal transition. Some days it will feel warm and mild if the sun is out and there is no wind, but then it can feel cooler in a matter of hours. The best bet is to bring fall clothing. Wear layers. Take off layers as needed. You can bring shorts and skirts, but make sure you have a sweater or warm jacket and a pair of pants or two. If you are visiting Barcelona for the nightlife, you have made a wise choice in picking this city. There are nightclubs catering to all types of genres of music and lifestyles. Most clubs have a dress code, so check ahead before you leave your home and pack the appropriate attire fitting the dress code of the clubs you prefer. November 1 is Diada de Tots Sants (All Saints Day), a public holiday celebrated by the locals who bring flowers to their deceased friends and relatives in the cemeteries. Also on this day, families get together to feast on seasonal produce, such as chestnuts and sweet potatoes. If you are in Barcelona anytime from the end of October to the end of November, check out the famous Barcelona Jazz Festival with concerts throughout the month at various venues in the city and surrounding areas. Independent Film Festival of Barcelona or L'Alternativa meaning "the alternative" focuses on supporting and promoting alternative film production. This November festival allows cinema lovers to overdose on the screening of about 170 movies from all over the world each year. The last two weeks of November bring the beginning of holiday celebrations with the lighting of Christmas lights around the city and the setting up of the huge ice skating rink in Placa de Catalunya, the city's main plaza.